As my husband and I recently traveled to Cincinnati, Ohio for a family reunion, it was a great opportunity to spend time visiting some historic sites in a city that was so active in the struggle for freedom. My brief time at the Oberlin Heritage Center (OHC) has helped me gain a greater appreciation of not only the local history of Oberlin, but the history that encapsulates some other communities in Ohio. I became curious of Cincinnati’s local history after touring the OHC Freedom Friend’s History Walk that touched on the connection between the seminary in Cincinnati and the early settlers of Oberlin. After a few word searches, I found information on the Harriet Beecher Stowe House. Harriet Beecher Stowe wrote the classic novel Uncle Tom’s Cabin, published in 1852, which depicts the horrors of slavery in the south. Additionally, I found information on the former location of the Lane Seminary which held debates on the issues of slavery. A historical marker sits in front of a Cadillac dealership that was the former site of the seminary. It is in walking distance of the Beecher House. As our visit to Cincinnati was winding down, I made my way towards Madison Avenue in Cincinnati to seek out the only remaining building that documents a turbulent time in Cincinnati’s history as well as our nation. 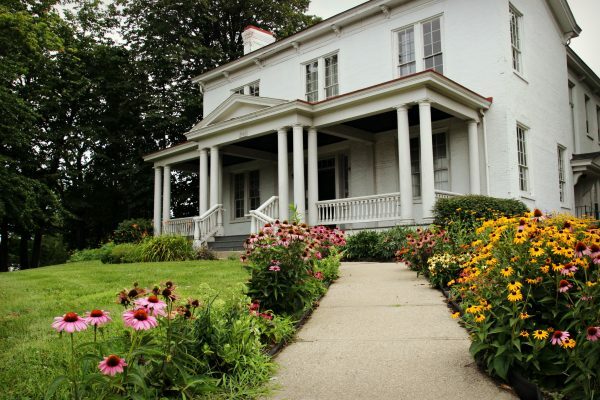 The Beecher House is located in the historic Walnut Hills neighborhood of Cincinnati and served as the residence of Harriet Beecher Stowe and her father, Rev. Lyman Beecher, the president of Lane Seminary. When I arrived at the house, a number of adults and children were touring the first and second floors. Once you enter the house, you find yourself in a large foyer and facing a long hallway which stretches into the back addition. I was told that the first three rooms were the original structure of the house. The front room to the right, which may have served as the parlor, had a poster board presentation on the Rev. Lyman Beecher, the Lane Seminary, and individuals in the community including local abolitionists. Our tour guide spoke of a community that was benefiting economically from the commercial activity along the Ohio River and the conflict over not viewing slaves as equals. Many students at the seminary and local abolitionists found the conditions unacceptable and sought immediate emancipation for those enslaved. Lyman Beecher was portrayed as part of the former, which resulted in the turmoil at the seminary. A fourteen day debate on the issues of slavery ensued over the merits of emancipation versus slavery. people left the south for Ohio. In 1835, the timeline indicated that many students left Lane Seminary and traveled to nearby Cumminsville, Ohio and then unto Oberlin, Ohio to continue their studies and work towards emancipation. My visit to the Harriet Beecher Stowe House led full-circle to another guided tour by the Oberlin Heritage Center entitled Scholars and Settlers, which led us through the early settling and growth of Oberlin College. This tour began at the corner of College and Main Streets in Oberlin and proceeded along the brick and paved walkway around Tappan Square. As our small group walked along College Street near the Oberlin Conservatory of Music, I was pleasantly surprised to see the former location of the large wood dormitory that housed those early settlers from Cincinnati.